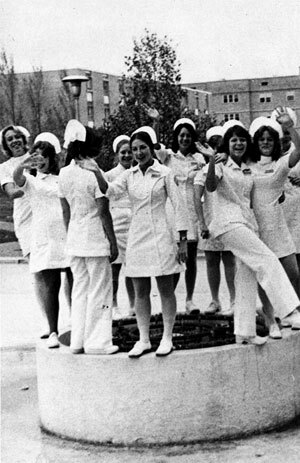 By 1975, the MU School of Nursing had become an independent academic unit, and nurses could earn bachelor’s degrees and post-graduate degrees there. Nursing was an integral part of the Parker Memorial Hospital Training School, which served as the University of Missouri’s first hospital in 1901. Although a nursing program was not officially established until 1920 within the School of Medicine, MU’s first class of nurses graduated in 1904. Sixteen years later, the Board of Curators approved a graduate nursing designation. In 1940, the Board of Curators approved a three-year combined curriculum of nursing and arts and science courses leading to a bachelor of science in nursing. In 1950, the four-year BSN program was approved and the master’s of science in nursing program began in 1968. The PhD program began in 1994 and transitioned to an online, or distance-mediated, format in summer 2010. The RN to BSN option was initiated in 1999 followed by the Accelerated BSN program in 2003. The doctor of nursing practice (DNP) distance-mediated program began in summer 2010. During the 1950s and 1960s, many new buildings were constructed by the university, many of which directly benefited medical and nursing students. Among the improvements were the Medical Science Building and the Nurses’ Residence (McHaney Hall), which is currently part of University Health Care. Clinical teaching facilities were expanded to include the University Hospital, Missouri Psychiatric Center, MU Women’s and Children’s Hospital, Boone Hospital Center and the Harry S. Truman Memorial Veterans’ Hospital. In 1973 the school became an autonomous division.Construction on the School of Nursing building began in 1978 and occupied in June 1979. In 1994, the nursing program was officially named the Charles and Josie Smith Sinclair School of Nursing. The Sinclairs highly valued the nursing care they received and provided a substantial endowment to benefit the School and its students. A new chapter opened when the School surged into the national research spotlight in the mid-1990s. The Office of Research had a dramatic expansion in grant funding since that time, and in 2001 the school moved from 40th to 17th in National Institutes of Health-funded grants. Research focused on such topics as breast cancer, alcoholism, smoking cessation during pregnancy, elder care, wound healing and family obligations to older adults. Through the extraordinary efforts and dedication of the Office of Research, major funding facilitated the development of TigerPlace and Senior Care. Senior Care, the home-health agency of the school, was formed in 1999, and in 2006, it changed its name to MU Sinclair Home Care. University of Missouri Health Care assumed management responsibilities in July 2006. In July 2009, Oxford HealthCare acquired Sinclair Home Care. TigerPlace, which opened in 2004, is designed to keep seniors living independently in their apartments and to bring health care to them — a model called “aging in place.” It also provides an interdisciplinary forum where MU students, faculty and researchers from across campus can interact with seniors about their concerns and needs. The School of Nursing took over the nursing care for residents of TigerPlace in 2008. In 2001 the Center on Aging became an integral part of the school’s effort to enhance the quality of health care for older adults. In 2005, the center became the MU Interdisciplinary Center on Aging. The new center’s foundation exists among the three health-sciences schools (nursing, medicine and health professions) and interdisciplinary colleagues (e.g., engineering, social work, human development, psychology). In 2003, the Nightingale Society, the nursing school’s gifting society, was established. In 2012, the School announced a $14.8 million grant from the U.S. Department of Health and Human Services Centers for Medicare and Medicaid Services (CMS) to reduce avoidable re-hospitalizations among nursing home residents. This grant was the largest research grant in the history of the University of Missouri. Then in 2016, the School announced a grant for $19.8 million again from the U.S. Department of Health and Human Services Centers for Medicare & Medicaid Services (CMS) to expand their Missouri Quality Initiative for Nursing Homes – making this the University’s largest research grant.